GALT has helped thousands of greyhounds find their forever homes! Click on the links below to learn more about these lucky greyhounds. The most recent twelve adoptions are at the top with pictures, followed by a list of names. These are the original GALT names for the dogs, not the names their owners have given them. Be sure to visit the GALT Photo Gallery to see some greyt "after adoption" pictures! 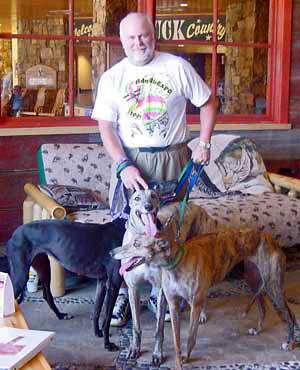 GALT's very first adopted greyhound, Magellan (in the middle), brought his Dad and greyhound sisters by an event to say "Roo"!